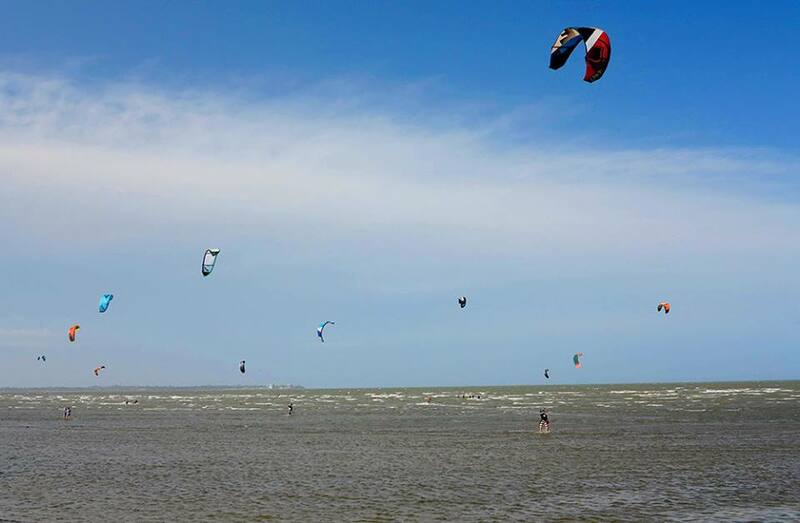 It’s described as an extreme sport, one that combines aspects of wakeboarding, windsurfing, surfing, paragliding and gymnastics and there are at least eight different styles for its proponents to tackle – as long as there’s a decent wind. 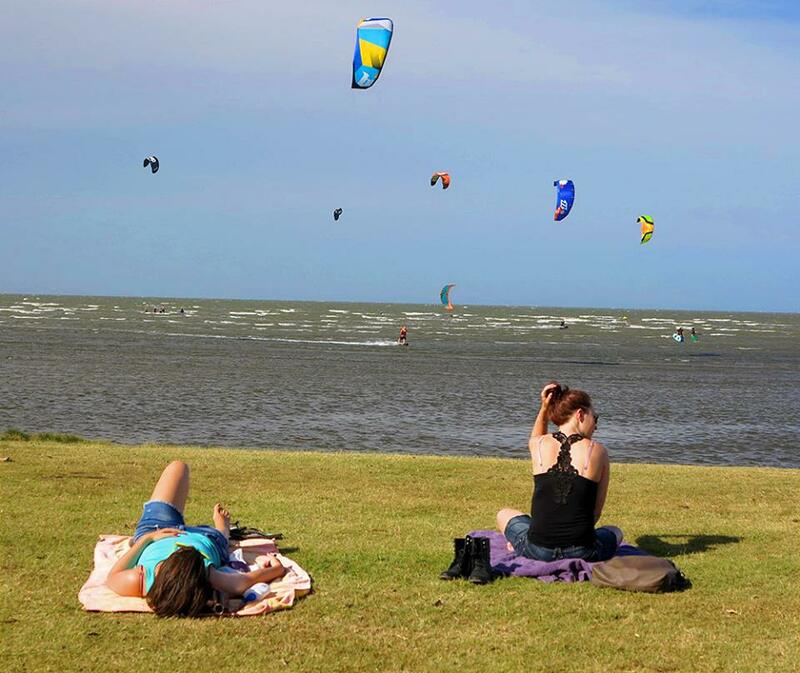 And over this weekend there have been plenty of 15-25 knot winds along the shores of Bramble Bay – especially the stretch between Brighton and Sandgate on the northern outskirts of Brisbane – to delight power kite devotees. On Sunday afternoon, more than 100 of them were ducking, weaving, leaping and whizzing to and fro across the Bay’s choppy waters. The scene was more like a crazy speedway than the usual calm and lightly used waters seen along this 4km stretch of coast. At the Brighton end in the early afternoon, there would have been 40+ kitesurfers out on the water and another 20+ gearing up to join them or just taking a break. To the south, at Sandgate, there were easily another 30 out on the water, including a group undergoing lessons with a local kite school. Up close the gear is impressive. The leading edge of a power kite is inflated to help the device get and stay aloft. Its guide ropes, laid out carefully in a straight line prior to takeoff, control the kite’s direction simply via a crossbar that is attached to a harness worn by the kitesurfer. Smart users opt for a safety helmet as well. 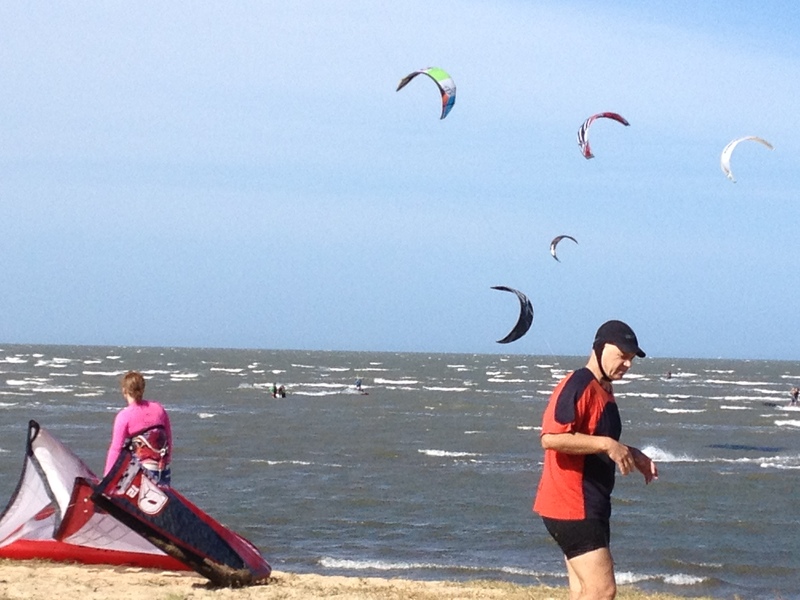 The Brighton-Sandgate foreshore is an ideal place for the sport, as deep grassy verges at both ends allow kitesurfers to observe, prepare and pack up afterwards without blocking access to pedestrians, vehicles and others visiting the area. In a stiff breeze, learners can opt to simply body drag through the water, powered by their kite, while more advanced users will usually prefer to skip along on top of the water with their feet strapped to a snowboard-sized deck, showing off their aerial skills with periodic jumps, spins and other manoeuvres. Size and design are features of note as well. There was very little repetition in this weekend’s power kites, either, with distinctive patterns and shapes very much in vogue. 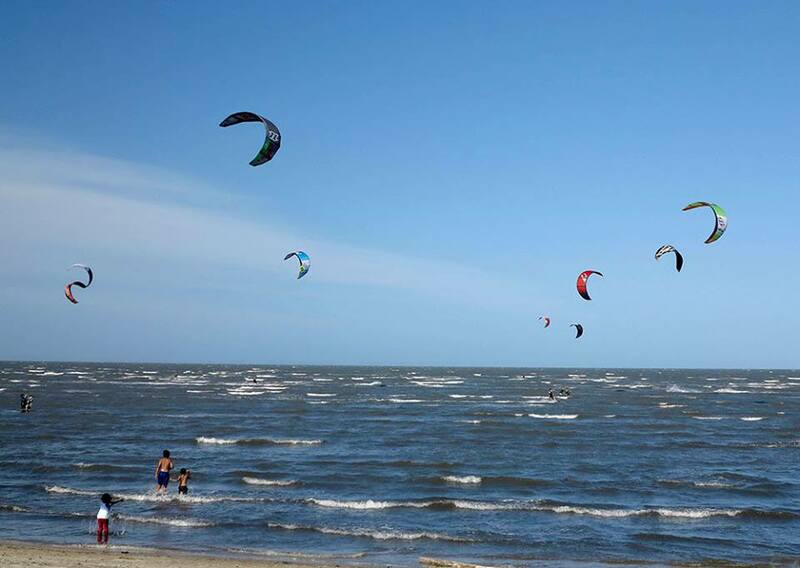 One kitesurfer explained that it was possible to go out in light breezes and, for the more experienced, taking off in winds of up to 50 knots was not uncommon. However, the stronger the wind, he said, the smaller the kite that was needed to stay safe. The trick is to know just how fast the wind is blowing and, for that, there are several handy, real time wind speed websites just for this sport’s devotees (windguru, windfinder and kitesurfreport). Around the world this extreme sport is booming, with its proponents taking to lakes, oceans and rivers with their kites and boards for kitesurfing; to beaches, parks and grassy areas with traction kites combined with wheeled boards; to snowfields with snowkites paired with snowboards; and to large, open flat areas such as saltpans with their kites driving three-wheeled kite buggies. But this much fun and speed in high winds must come at a cost. Lessons seem a wise investment and should set a new user back less than $200 for a 2-hour session and around $400 for a full course of 6-8 hours. Trainer kites start at around $200 new but top-flight kites can run into the thousands of dollars. An Australian website, seabreeze.com.au, has some useful tips for those considering buying secondhand. While the expense of getting seriously into the sport is not insubstantial, a basic kit is not a prohibitive investment and, at some locations, gear can be hired. However, there is clearly potential for injuries from misuse, overuse, strains, sprains and collisions in unpredictable winds. 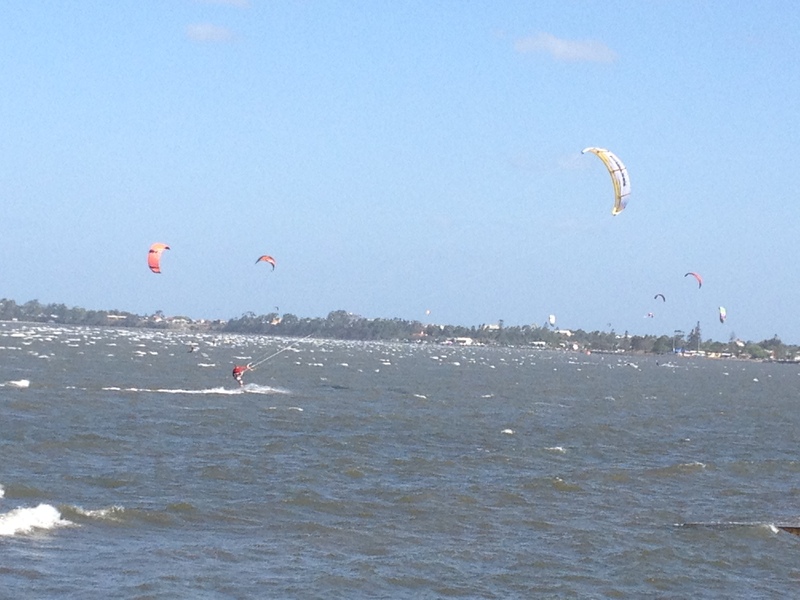 The good news is the Australian Kite Surfing Association offers members insurance as part of its $125 annual fee ($95 for youth members), which could be a very wise move. 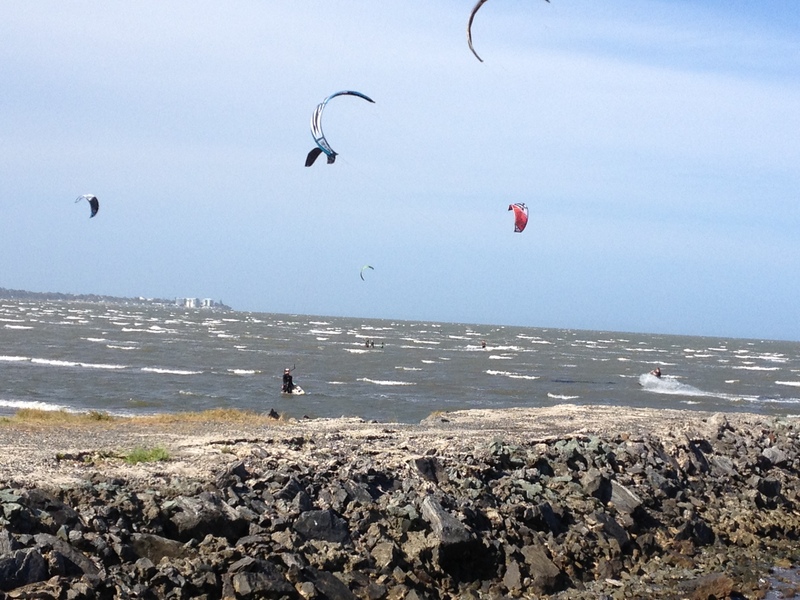 Watch this video to see some of the kitesurfing excitement that’s happening along our coastline. Glad you enjoyed the read. Hope your boys really get into it, as it looks like a great way to keep fit.